Unless you have been living under a rock on an isolated island, I am sure you have heard that lifestyle choices have big impact on both your health and how long you live. Living longer means not dying sooner. And, to not die sooner, you must take actions that eliminate the various ways one dies. Living healthy, means taking actions to prevent all the ways one loses their abilities to enjoy day-to-day activities of life. Or, at least postpone the time as far into the future as possible before developing disabilities. 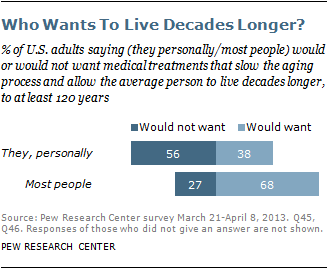 In both case, i.e., living longer and living healthy, lifestyle choices play crucial roles. But what are these life choices, besides the ones you hear all the time: Eat Better and Exercise. When I started to systematically pursue this topic of living optimal lifespan possible (my goal being 120 years), with optimal health span (my goal being no disabilities), I started enumerating all areas of life in which one can take some action to make this impact. Of course, not everything is in our control. We did not come to this earth with guarantees. Unforeseen, random event, or events that are not in our control can ruin all our goals and plans. But the objective is to not let the possibility of events not in our control prevent us from taking actions that are indeed in our control. So, here are all 13 dimensions of lifestyle that I have discovered so far that impact health span and life span. Each subject is a very extensive topic by itself. I just very briefly summarize my personal take on these and may be an example of how I am attempting to address them in my lifestyle and where you can read about further in these blog posts. Annually or Biennially: Telomere Measurements (DNA strands that dictate how long cells live), X-Rays of joints if I suspect arthritis etc., Ultrasound Study of Carotid and Aorta arteries, MRI’s to detect any tumors, eye-exam, hearing test, EKG. Every 5 years: Colonoscopy, Stress-test. 2. Nutrition – That is everything that crosses our lips, what we eat or drink. I discussed the topic of nutrition in a series of eight blog posts on this subject of Optimal Nutrition, Posts #22 through #29. additionally, Post #15, #31 and #32 discuss the topic of how and when to complement the nutrition with supplements. 3. Exercise – Exercise is indispensable for building and maintaining muscle strength, flexibility, balance, endurance. There is also abundant proof that it helps with the metabolism, overall health and health of specific organs. I discussed this topic of exercise in blog post #30 – How much and what type of exercise do you need for optimal health? 4. Maintaining Musco-skelatal Integrity: Pains in the back, knees, hips, shoulder, wrists and other various joints creep up. We may think that these pains just come out of nowhere. After all, we often notice that “yesterday it did not hurt and today it hurts”. So, it got be a random event. Right? Reality is that unless there was a trauma caused by an accident, most of these are the result of repetitive movement in un-aligned joints. The underlying cause could be neglect of the muscles, ligaments and tendons surrounding joints or prolonged asymmetrical movements, e.g., always carrying a bag on the same shoulder, or playing games such tennis or golf that inherently require asymmetrical movement. Yoga, myofascial massages, Rolfing, rolling with foam rollers, visiting a chiropractor for body alignment, weight bearing exercises for join strengths, e-cise routines designed by Pete Egoscue are methods I have learned for maintaining musco-skeletal integrity. I discuss some of these in Post #30 – How much and what type of exercise do you need for optimal health? And Post #49 – What is the role of massage therapy in Optimal Health? Also, I discuss how you can use foam rolling for body alignment in Post #39 – Ever heard of foam rolling. 5. Maintaining Optimal Dental Health: Good dental health not only impacts quality of your life, it can also impact how long you live. The American Heart Association published a Statement in April 2012 supporting an association between gum disease and heart disease. The article noted that current scientific data do not indicate if regular brushing and flossing or treatment of gum disease will decrease the incidence, rate or severity of the narrowing of the arteries (called atherosclerosis) that can lead to heart attacks and strokes. However, many studies show an as-yet-unexplained association between gum disease and several serious health conditions, including heart disease, even after adjusting for common risk factors. You may also have seen health and lifestyle surveys used for estimating life-expectancy that want to know if you floss daily. If you do the models give you credit for an extra 2 to 4 years of life. In Post #47 – What does optimal dental health look like and how to achieve it?, I discuss this topic in greater detail. 6. Maintaining Mind-body Connection: Our mind and body are inherently connected. Maintaining the connection between the two is essential for optimal health. Yoga, Tai Chi, Qigong, are some ways to develop and maintain mind-body connection. I have very limited experience with Tai Chi and Qigong. I do, however, perform Yoga as part of my lifestyle. In Post #11 – My first year of experience with Bikram Yoga, Post #12 – My second year of experience with Bikram Yoga, I describe how I incorporated Bikram Yoga into my lifestyle. 7. Enhancing and Maintaining Brain: If we lose vitality of the brain, the quality of life suffers dramatically. Alzheimer and other forms of Dementia can often be very painful way of living. Evidence is mounting that for optimal brain health, we must keep the brain stimulated with right activities. All my life, I have been very focused on left brain type of activities. As I was turning 60, I decided to do something about it and started taking piano lessons to stimulate my right brain and prevent any premature aging of the brain. I discuss the activities for maintaining optimal health in Post #57 – Optimal Mental Health – what is it and how to achieve it? 8. Stress Management: Stress is a root cause of many diseases. We have all experienced how stress can bring about disturbances in the digestive systems, back pain, high blood pressures, even heart attacks and strokes. Yoga and Meditation are two of the ways to manage stress. Perspective management is another powerful method. I got initiated in Transcendental Meditation over 30 years ago and I have been doing TM ever since with good benefits. I tackle the subject in Post #16 – What is stress really and why is it bad for longevity and health and Post #17 – Is meditation an effective antidote to stress. 9. Adequate Sleep: There is more and more evidence every day that inadequate sleep can cause all sorts of ailments. 7 to 9 hours of restful sleep is considered optimal. All my life, I thought the object of the game was to get away with as little a sleep as possible. Sleeping more than 6 hours every night is still a challenge for me. Although I am working on it to extend sleeping hours during the week and may be do some catch up sleeping during the weekends. Maybe I will tackle this topic in a future post. In Post #61 – How much sleep do we need? – I discuss the latest in sleep research. 10. Social Engagement: World-wide Study of Blue Zones, i.e., geographical areas where longest living people are clustered, showed a very surprising factor that contributed to long healthy life of people living there. Researchers found that people in Blue Zones are socially very engaged. Centenarians in these areas are engaged with tight knit groups of friends and family. So, the conclusion is that social engagement is an important factor in living longer and healthier. 11. Purposeful Living: It is well known that death rates spike after the holidays and after major life events. Researchers deduce from studies of such phenomena that people live only as long as they find life meaningful. Of course, it needs an ongoing effort to figure out what one can derive meaning from. One may find meaning in raising kids or grand kids, contributions to society, being the best spouse one can be or from “slaying some dragon”. Some people find meaning in their faith and service to God. Others find meaning in being of service to mankind or their fellow human beings. Yet others can find meaning in their job or career. Viktor Frankel in his book: Man’s Search for Meaning, explores this topic beautifully. Alternative schools of medicine, such as Ayurvedic, Homeopathy, Aquapuncture, Naturopathy, offer valid means for preventative care and whole-person healing. Leveraging these modalities of medical care as appropriate can offer means for optimal healing and living. Here the rule is the age old wisdom: An ounce of prevention is better than a pound of cure. 13. Making use of Genetics Science: There is of course the truth of genetics. Genes do play a role in how long we will live and what diseases we may have the tendencies to develop. Over the last few years, however, scientists are finding that inherited genes often do not determine your destiny, it is the lifestyle that can either turn those genes on or off. This is the exciting field of epigenetics. Studies from the filed of epigenetics do give us opportunities to leverage genes. Through genome mapping, we can find out what might be our tendencies and to what aspects of our life, therefore, we should pay particular attention. Over the last few years, I have gotten my telomeres measured – these are tips at the ends of genes that are considered to act like our lifespan clocks. I discussed this in Post #50 – How to optimize your health by maximizing your telomeres. More recently, I have sent for genetic testing to be able to receive personalized genetics bases lifestyle coaching. I will share results of that experiences in a future post. The percent of role of genes that we cannot do anything about is constantly shrinking all the time. Now it is believed that only between 5% to 15% of lifespan and health span is determined by genes that we have no control over. In summary, researchers have shown again and again that health span and life span depend upon one’s lifestyle choices. A holistic look at lifestyle choices means many different and distinct areas of life. I shared my take on these dimension of lifestyle and some of my experience. Also, gave references to where you can find more information, whenever, I have already discussed that topic in more detail in my blog posts. Do you think there some other dimension of lifestyle that I did not address here that is also important? Post #5 – Why do I want to live to 120? Now, I have to admit, before I started to get into such conversations, I just naively assumed that most people wanted to live as long as possible. After all, just look at the heroic efforts doctors, hospitals and patients put up to extend life just by few years, months and often even days. According to a detailed survey Pew Research Center conducted last year, comments of my in-laws are well represented in the mainstream of views across the US. 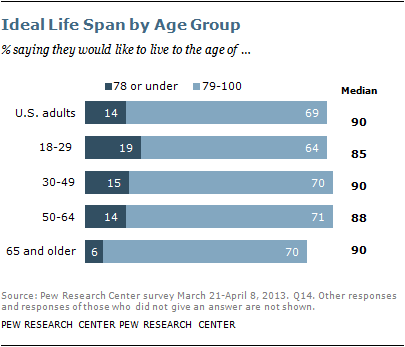 As the following figures show, only 38% of people in the US would want to live to 120 and most Americans expect to live to between 85 to 90 years. 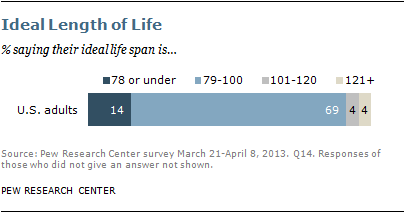 Only about 4% feel that ideal lifespan is between 100 and 120 and another 4% think it is over 120. 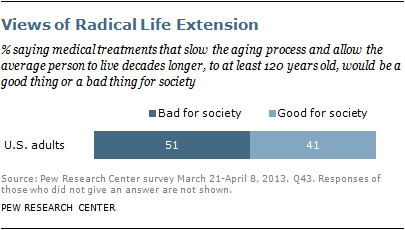 A majority of people think that living to 120 will be a bad thing for society. A surprising result survey researchers noted is that most of these measures are fairly constant across various religions, gender, education or political party affiliations in America. What would be the condition of their personal health? Will it be joyful living or a painful living? Will they have financial means to sustain themselves? Being broke is not much fun. Will their peers and loved ones be around? If not, will it be worth living? As for myself personally, I feel that there are two major objectives of life: Growth and Contribution. Thus my rationale for wanting to live to 120 is to simply maximize the time I have available to grow and contribute. Additionally, purposely living to 120, learning some things along the way, sharing with others as I learn, seem to fit in with my personal growth and contribution model of life. In this sort of context, I see the three common objections cited above, as challenges to overcome as I pursue the goal of purposely living to 120. Moreover, not only I want to live to 120, but I wish to do it healthfully, purposefully and joyfully. Looking at it another way, I feel, if it is okay to expect to get to 90 healthfully, purposefully and joyfully, why not to 120? And, of course, as my mother-in-laws suspected, a key purpose for me to write this blog and engage in conversations with family, friends, loved ones is to motivate them and along the way find others who would want to share this journey together. How do you feel about living to 120? What do you think it would take to live to 120 healthfully, purposefully, and joyfully? Please leave comments to this post. I and others following this blog would love to hear your perspective!